Few destinations offer the incredible array of accommodation types found on the Gold Coast. 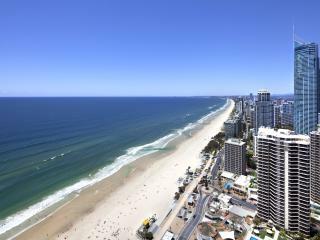 Click on the region headings below for a list of Gold Coast accommodation in that area. For maps and general holiday info visit our Gold Coast visitors information page. For a quick comparison of prices across all Gold Coast accommodation visit our Gold Coast hotels page. Just 20 minutes north of Surfers, Australia's first fully integrated tourism resort is sited on 474 hectares and is designed in picturesque surrounds around four man-made harbours on the Coomera River. The waterfront Marine Village features more than 80 specialty stores, cafes and restaurants, a Health & Fitness Centre, and 2 Championship Golf Courses. Main Beach is located on the Spit at the northern end of the Gold Coast. From designer boutiques and specialty stores, to the tempting array of fabulous eateries, Main Beach's Tedder Avenue offers a chic yet relaxed atmosphere by day or night. There are a number of wine bars where you can enjoy a drink and sit back and watch the world go by. Along the busiest stretch of the Gold Coast is Surfers Paradise beach - a great spot for families with its perfect swimming beach and range of other activities. Surfers is home to many attractions, including everything from bungee jumping, ice skating, to the Indy 500. There are countless restaurants, nightclubs and bars to spend the night away. Just south of Surfers Paradise is Broadbeach, one of the fastest growing resort style shopping areas on the Gold Coast, with major shopping areas; Pacific Fair and Oasis on Broadbeach. With the beach as your backdrop, shopping can become a totally relaxing experience. The area also features an exciting cafe precinct with pavement cafes and restaurants offering something to suit every taste. Just south of Broadbeach is Mermaid Beach, home to some the Gold Coast's most prestigious beachfront mansions along Hedges Avenue. This prime location is known for its surfing and at the Mermaid Beach Surf Life Saving Club you can take in some of that history as well as enjoying a delicious meal on the balcony overlooking the stunning Mermaid Beach. Take in some serious shopping at Pacific Fair Shopping Centre in Broadbeach only a short drive or bus ride away. Burleigh Heads is halfway between Coolangatta and Surfers Paradise within easy reach of the lively nightlife to the north and the more relaxed family atmosphere of the southern beaches. 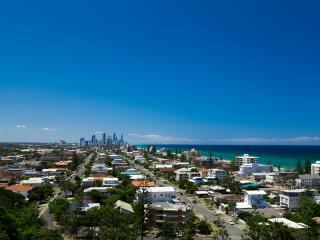 Burleigh is renowned for its good surfing beach and its regular hosting of surfing and ironman competitions. 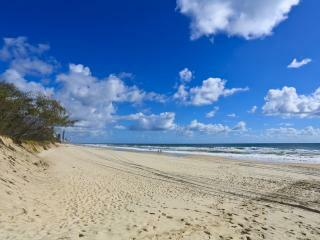 At the southern end of the Gold Coast, Coolangatta has some of the Coast's prettiest beaches. Coolangatta's bistros and cafes are close by for lunch or a snack. Every second Sunday market stalls are set up along the beachfront where you can browse through a selection of local handicrafts.